The Itty Bitty Kitty Committee: Butterbean Birthday pt 2; Bring on the Presents! Butterbean Birthday pt 2; Bring on the Presents! I had high hopes Charlene would have a box of kittens to open today. No such luck, we're still waiting! But an integral part of her favorite game, "Bat the Balls from the Back of the Chair". Oh my gosh that video is so awesome!! And Charlene is so lucky - sparkly balls are awesome!! What a great present (though some kittens would be nice too, we know). Beautiful *and* a gifted athlete. Who knew? Patience, Birthday Bean, your kittens are on back order. My girls love the sparkle balls. Light weight, catches the light and fun to carry around in the mouth. 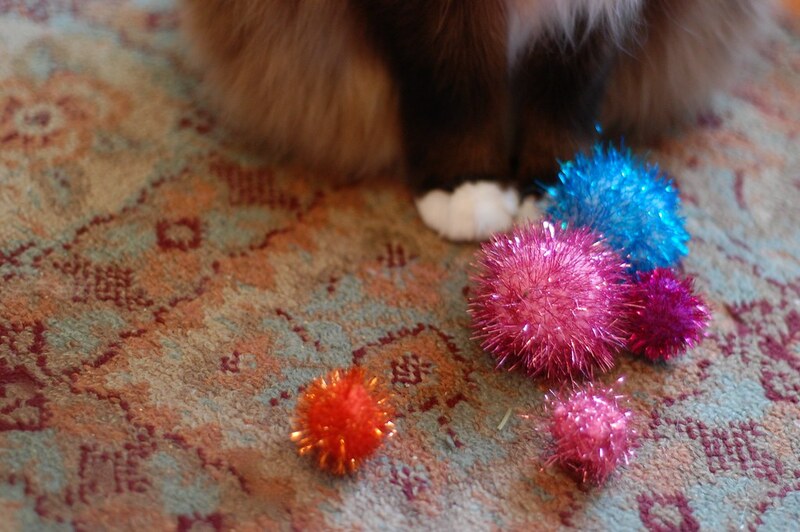 Of course, the balls all end up under the couch or other large furniture item. Oh Miss Butterbean, happy birthday! I hope it's a great one filled with calamari and sparkly balls and anything else your kitty heart desires. Can I have Charlene as my tennis doubles partner? What a volley! Wow - have the Red Sox called you yet, Charlene? You would be a natural! Happy Birthday, dearest Bean! Hey Charlene, I didn't know you were a southpaw! Congrats on the sparkle balls. 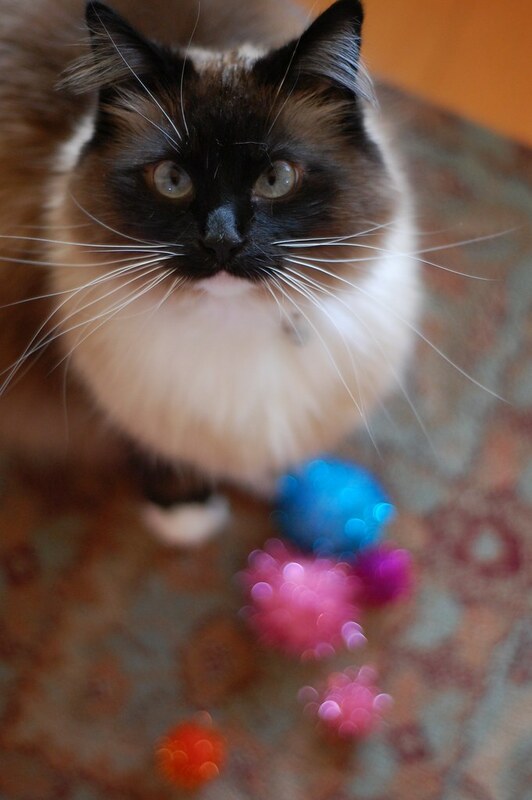 Unfortunately for the cats hereabouts, all balls and mousies become the almost instantaneous possession of a Golden Retriever, whereupon they are spitty and nasty! Ah, the glitter balls. Those are very popular in our household, too. Put one in front of Happy, who is 10, and he's like a kitten again. It's fun to watch. Cats must have a natural talent for hitting things flying at them. We have video of three of our cats consistently hitting little toy balls from atop their cat tree. And they act really cool about it, not frenzy-excited like they get over a feather on a stick. And happy birthday to the best Butterbean. cats are so weird, and Butterbean does not disappoint. Happy Birthday Queen Charlene Butterbean! Aw.. such a good little batter. And I thought that my dear departed Dusty was the best ball batter around. happy birthday bean! i'm impressed by your skills! cat - we're not sure when drewey was born. she was a year or two old when she came to us. cynthia,, i use photobooth to take the movies which for some reason flips the image, so it looks like she's a south paw.. but she's actually not. the movie is just backwards. happy birthday butterbean from the 3 of us! thanks for all the joy your kitten wrangling brings the human of us (that'd be brooke). hopefully one day when we end up back in the pac nw (doing a phd in logan, ut) we'll be able to bring one (or two) of your kittens into our little household. These aren't KITTENS!!!!! Oooooh shiny! Charlene is just so beautiful. I am struck by every picture. Oh sparkle balls are the best! A big favorite here at Casa di Monster Cat too!